Join Mika, a cute little bear on secret quest to avoid hibernation so that she can see the beauty of the Northern Lights for herself! 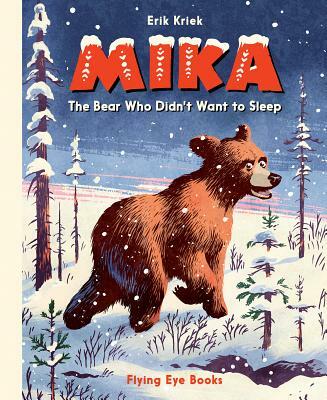 Mika is a little bear who loves to run and play all over the forest, but she soon learns that winter is on its way, and she is supposed to spend these long, cold months hibernating with her mother and father. When the Old Owl tells Mika about the Northern Lights that appear every winter, she can't stand the thought of missing something so beautiful, and so she sets out on a secret, snowy adventure to find them! Erik Kriek is a freelance illustrator and comic artist who studied illustration and graphic arts at the Rietveld Academy for Art and Design in Amsterdam. His popular comic book series, Gutsman, received national acclaim and was adapted for the stage, earning Erik the 2008 Stripschapprijs. He is currently based in Amsterdam. "A bedtime bear book with vintage flair. [...] Old-fashioned in the beary best of ways."